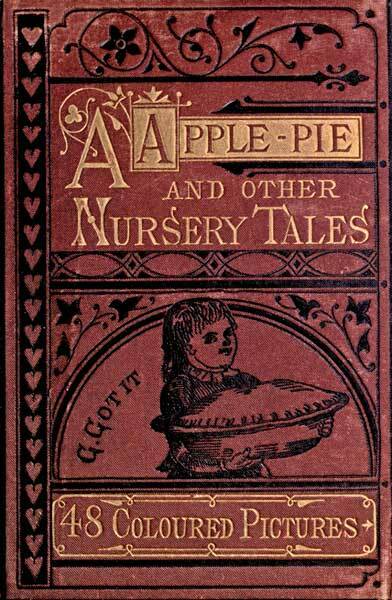 A APPLE PIE AND OTHER NURSERY TALES. FORTY-EIGHT PAGES OF ILLUSTRATIONS PRINTED IN COLOURS BY KRONHEIM & Co. LONDON AND NEW YORK: GEORGE ROUTLEDGE AND SONS. THE CATS' TEA PARTY. CONTENTS. THE HISTORY OF A APPLE PIE. A Apple Pie. B bit it. C cut it. AApple Pie. BBit it. CCut it. D dealt it. E eat it. F fought for it. DDealt it. EEat it. FFought for it. G got it. H hid it. J joined it. GGot it. HHid it. JJoined it. K kept it. L longed for it. M mourned for it. KKept it. LLonged for it. MMourned for it. N nodded at it. O opened it. P peeped at it. NNodded at it. OOpened it. PPeeped at it. Q quartered it. R ran for it. S stole it. QQuartered it. RRan for it. SStole it. T took it. V viewed it. W wanted it. TTook it. VViewed it. WWanted it. X Y Z & Amperse andAll wished for a piece in hand. XYZ& Amperse and All wished for A piece in hand. MISS PUSSYCAT'S TEA PARTY. Jacko the Monkey is sent with the invitations. Miss Tabitha Pussycat was a quiet, sleek, old creature, and was so prim, that her friends called her an old maid; and some of them even said that she was an old cat, but they were the people who were not asked to her nice tea parties. When she gave a tea party, she sent her page Jacko to invite her friends. Jacko was a clever monkey, who had come from his last place at the Zoological Gardens, where he had been used to see a great deal of company. One day Miss Tabitha made up her mind to have a larger party than usual, so she sent out for a dish of pink shrimps, a bag of muffins, a tea-cake, a new French loaf, and a pound of fresh butter. Then she sent Jacko out in his new coat to invite her friends. Mr. Velvet-Purr and other visitors arrive at Miss Tabitha's. First, there was Mr. Velvet Purr, a quiet old bachelor, who sat nearly all day in the sun on a garden seat watching the birds, but who was much too well fed to catch mice. Miss Velveteen Purr, his sister, went with him, she was a very pretty singer, wore a fur tippet, and drank a good deal of milk to soften her voice. Sir Claude Scratch was a very different person. He was proud of his high family, for his father was second cousin to *** Whittington's Cat, and had seen a great deal of the world. Sir Claude was very proud of his whiskers, and before he went to the tea party, he called on Frizzle Frog, the barber, to be shaved. While he sat there, with the towel under his chin, who should look in, but his friend Captain Black, a very fierce looking fellow, who had killed hundreds of rats, and was always ready to fight. 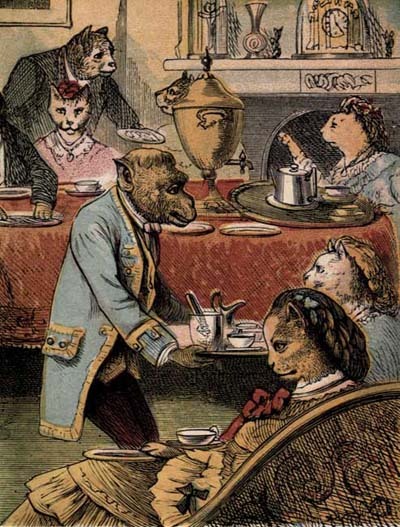 He was a great favourite of the ladies, and said he would go to tea though he had not been invited. Sir Claude Scratch calls on Frizzle Frog the barber, and while he is being shaved, Captain Black drops in. The four Misses White were already on their way to Miss Pussycat's house in their clean stockings, and the nice silky dresses that their mother had given them. Old Mrs. White lived at the baker's round the corner, and her daughters' names were Fluffy, Tibby, ***, and Tip; all of them famous for their beautiful skins and their bright eyes. You may be sure that the four Masters Tortoise Shell were waiting for them, for they had been ready all the afternoon, with their tail-coats on, for the purpose of walking with these charming young ladies. They were very young gentlemen, so that they were quite proud at being asked. It was a very grand tea table, and when all the party sat down it was more than Jacko could do to wait upon them,—but the gentlemen handed the tea to the ladies, and picked out the largest shrimps for the Misses White, and nearly emptied the cream jug for Miss Velvet Purr, and helped themselves to muffins, and were very merry indeed. Captain Black was so attentive that he would hand round the bread and butter. He took the plate from under the very nose of Sir Claude Scratch, which made that person so angry, that nothing but a smile from Miss Tabitha would please him. Miss Velvet-Purr sings a song, which is much admired. After tea Miss Purr was asked to sing, and when she had taken another sip of milk she said she would give them an old song with variations. It was called Moll Rowdy, and the accompaniment was by Spitz, and everybody said that there never was anything more striking. Then Miss Tabitha, who had a very fine ear, gave them a little French song which had a chorus of Tant Mieux, and they all joined in, Captain Black and Mr. Velvet Purr singing the bass. Then the Captain told a story of his travels to the Isle of Dogs, and Sir Claude related an adventure at St. Kitts, which set them all laughing. But the great fun of the evening was when the four Masters Tortoise Shell, whose names were Bobstay, Rattle, Clipper, and ***, came into the room with great white collars and black faces, and began to sing like the Ethiopian Serenaders. Bobstay played the Fiddle, Rattle the Bones, Clipper the Banjo, and *** the Tambourine, when they sang “Old Dan Tucker,” and “Kafoozlum.” The four Misses White almost fell off their seats with laughing, and Sir Claude was seen to put the tail of his coat into his mouth; Captain Black didn't like it much, for he had a dark complexion and thought they were laughing at him. But the great fun of the evening was when the four Masters Tortoise Shell appeared as Ethiopian Serenaders. At last it was time for them to be going, and Mr. Velvet Purr who was very careful not to be out too late, brushed his coat in the hall, and said good night. Captain Black smoothed his fur jacket; Sir Claude Scratch stroked his whiskers, and the ladies began to arrange their dress for walking. Then there was such a fuss as they all said “Good-bye,” that some of the neighbours looked out of window to see what was the matter; especially as Captain Black and Sir Claude quarrelled and fought in the street. At last, however, all the party got safely home. Departure of the Guests. Captain Black and Sir Claude Scratch quarrel in the street. THIS LITTLE PIG WENT TO MARKET. THIS LITTLE PIG WENT TO MARKET THIS LITTLE PIG STAYED AT HOME, THIS LITTLE PIG HAD ROAST BEEF, THIS LITTLE PIG HAD NONE. THIS LITTLE PIG CRIED WEE! WEE! ALL THE WAY HOME. NURSERY RHYMES. II. Ride a cockhorse, to Banbury Cross, To see little Jenny upon a white horse. There was an old woman and what do you think, She lived upon nothing but victuals and drink. Victuals and drink were the chief of her diet, Yet the plaguey old woman could never be quiet. A fox jumped up on a moonlight night, The stars were shining and all things bright. “Oh, ho!” said the Fox, “it's a very fine night For me to go through the town, heigho!” Ding *** bell, ***'s in the well. Who put her in? Little Tommy Green. Who got her out? Dog with long snout. What a naughty boy was that, to try to drown poor ***-cat. There was an old woman tossed up in a basket, Ninety times as high as the moon; And where she was going I couldn't but ask it, For in her hand she carried a broom. Old Mother Hubbard she went to the cupboard, To get the poor dog a bone. When she came there the cupboard was bare, And so the poor dog had none. I had a little pony, They called him Dapple Grey; I lent him to a lady To ride a mile away. *** sits beside the fire, how can she be fair? In walks a little doggy, “***, are you there?” THE THREE BEARS. The Three Bears take a walk. In a far-off country there was once a little girl, who was called Silver-Locks, because her curly hair shone so very brightly. But she was not so good as she was pretty, for she was a sad romp, and so restless that she could not be kept quiet at home, and would often run out when she was told not to do so. One day, she started off into a wood, to gather wild flowers and to chase butterflies. She ran here, and ran there, and went so far, at last, that she found herself in quite a lonely place, and there she saw a snug little house, in which three Bears lived; but they were not then at home. The door and the parlour window being open, Silver-Locks peeped in, and soon found the place was empty; so the saucy *** made up her mind to go in boldly, and look all about the place, little thinking what sort of folks lived there. Little Silverlocks enters the Bears' dwelling. Now the three Bears had gone out to take a walk, a little while before this. The biggest of them was the Papa Bear, who had a very rough coat, and was named Mr. Bruin. The next Bear in size was his wife, called Mammy ***, from her smooth skin; and the smallest of the three was their little darling, Tiny. Before going out, Mammy *** put the nice soup she had made for dinner on a great chest in the parlour to cool; as they were very hungry, they meant to be back in a short time. Silverlocks finds three jars of soup set for the Bears' dinner. When Silverlocks went into the house, she soon found by the smell that something nice had been cooked. On going into the parlour, sure enough she saw there three jars smoking away: the first, a very large one, for Mr. Bruin; the next of middling size, for Mammy ***; and the smallest of all was Tiny's jar; and in each of them was a wooden spoon. The little busy-body now went to work tasting the soup in each jar by turns; but she found that in the smallest jar was the nicest to her taste. Silverlocks tastes the soup and chooses the jar set for Tiny, the little Bear. Silver-Locks was now in high glee, and thought to enjoy herself, hungry as she was, by eating up all the soup in the little jar. But she was too weary to be standing all the time, so she looked about for a seat. There were three chairs in the parlour, a very large one for Mr. Bruin, another of middling size for Mrs. B., and a nice little chair for Tiny. The little girl tried them all in turn; she found that the smallest suited her best, and down she sat, and began to eat her soup with great relish. Silverlocks seats herself in Tiny's little chair and eats his soup. When Silver-Locks had nearly eaten up all poor Tiny's soup, she began to rock herself to and fro in his little chair: she had often been punished for this naughty trick, but without effect. While she was indulging this silly whim, out came the rush-bottom of the chair, and she and the soup jar rolled on the floor. But she did not mind this at all, thinking it was fine fun. She now thought she would go up stairs, and see all that was to be seen: and there we will leave her for the present. Silverlocks goes upstairs to the Bears' bedroom. When the three Bears came back, they found that some one had been there. “Who has been to my soup?” roared out Mr. Bruin. “And who has been to my soup?” said Mrs. B., with a low growl. Then poor Tiny cried, “Somebody has been to my soup, and has eaten it all up!” Then said the big Bear, fiercely, “Who has moved my chair about?” Mrs. B., too, said, “Who has moved my chair about?” Then Tiny cried pitifully, “Somebody has sat in my chair, and broken it in pieces!” And lying down on Tiny's bed, falls asleep. In the room up stairs there were three beds: the largest was Mr. Bruin's bed; the next was Mrs. B. 's; and the smallest of the three was Tiny's bed. Silver-Locks tried them all, but she found the little one the most comfortable; and as she was very sleepy, she crept into it, and fell fast asleep. The three Bears, thinking that somebody was in the house, came up stairs to look, and found their beds had been disturbed, and they all, in angry voices, asked who had dared to do it. The Bears come home and find Silverlocks on the bed, but she awakes in time and escapes through the window. Silver-Locks did not hear the gruff voices of Mr. and Mrs. Bruin, but the sharp squeak of Master Tiny's voice aroused her from her slumber. “Somebody has disturbed my bed,” cried he; and in a moment after he added, “and here she is!” looking at the same time as fierce as a little Bear who had lost his dinner could do. The little girl was now almost frightened to death, especially when she saw at the other end of the room two larger Bears, in a terrible rage. Luckily for her, there was an open window close to Tiny's bed, and seeing this, she jumped out of bed in a moment, and then took a spring, and escaped out of window, falling on some soft grass below. The three Bears came to the open window, and stared wildly at her, so she soon got up, and ran as fast as she could, until she got safe home again. Here she was properly punished for her wilful behaviour, besides the great fright she suffered from the savage looks and angry growling of the Three Bears. LITTLE RED RIDING-HOOD. Little Red Riding-Hood sets out to visit her Grandmother. Once upon a time a nice little girl lived in a country village, and she was the sweetest creature that ever was seen; her mother loved her with great fondness, and her grandmother doted on her still more. A pretty red-coloured hood had been made for the little girl, which so much became her, that every one called her Little Red Riding-Hood. One day, her mother having made some cheesecakes, said to her: “Go, my child, and see how your grandmother does, for I hear she is ill; carry her some of these cakes, and a little pot of butter.” Little Red Riding-Hood immediately set out, with a basket filled with the cakes and the pot of butter, for her grandmother's house, which was in a village a little distant from her mother's. Little Red Riding-Hood meets the Wolf. As she was crossing a wood, which lay in her road, she met a Gaffer Wolf, who had a great mind to eat her up, but dared not indulge his wicked wish, because of some woodcutters who were at work near them in the forest. He ventured, however, to ask her whither she was going. The little girl, not knowing how dangerous it was to talk to a wolf, replied: “I am going to see my grandmamma, and carry her these cakes and a pot of butter.” Little Red Riding-Hood loiters by the way. “Does she live far off?” said the Wolf. “Oh, yes,” answered Little Red Riding-Hood, “beyond the mill you see yonder, at the first house in the village.” The Wolf arrives at the Grandmother's house before Little Red Riding-Hood. “Well,” said the Wolf, “I will go and see her too; I will take this way, and you take that, and let us see which will be there the sooner.” The Wolf set out, running as fast as he could, and taking the nearest way; while the little girl took the longest, and amused herself as she went along with gathering nuts, running after butterflies, and making nosegays of such flowers as she found within her reach. The Wolf soon arrived at the dwelling of the grandmother, and knocked at the door. “Who is there?” said the old woman. “It is your grandchild, Little Red Riding-Hood,” replied the Wolf, in the voice of the little girl; “I have brought you some cheesecakes, and a little pot of butter, that mamma has sent you.” The Wolf attacks the poor Grandmother. The good old woman, who was ill in bed, then called out, “Pull the bobbin, and the latch will go up.” The Wolf pulled the bobbin, and the door opened. He sprang upon the poor old grandmother, and ate her up in a few minutes, for it was three days since he had tasted any food. The Wolf puts on the Grandmother's night-gown and cap The Wolf then shut the door, and laid himself down in the bed, and waited for Little Red Riding-Hood, who very soon after reached the door. Tap, tap! 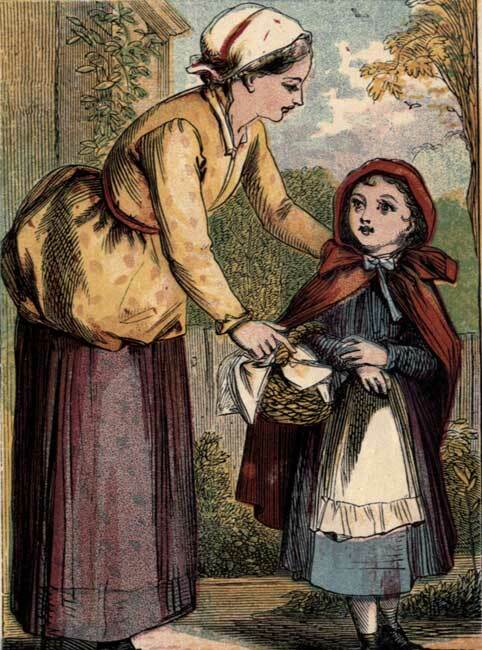 “Who is there?” She was at first a little frightened at the hoarse voice of the Wolf, but believing that her grandmother had got a cold she answered: “It is your grandchild, Little Red Riding-Hood. Mamma has sent you some cheesecakes, and a little pot of butter.” The Wolf called out, softening his voice: “Pull the bobbin, and the latch will go up.” Little Red Riding-Hood pulled the bobbin, and the door opened. And deceives Little Red Riding-Hood. When she came into the room, the Wolf, hiding himself under the bed-clothes, said to her, trying all he could to speak in a feeble voice, “Put the basket, my child, on the stool, take off your clothes, and come into bed with me.” “Grandmamma! what great teeth you have!” Little Red Riding-Hood accordingly undressed herself, and stepped into bed; where, wondering to see how her grandmother looked in her nightclothes, she said to her: “Grandmother, what great arms you have got!” “The better to hug thee, my child.” “Grandmother, what great ears you have got!” “The better to hear thee, my child.” “Grandmother, what great eyes, you have got!” “The better to see thee, my child.” “Grandmother, what great teeth you have got!” “They are to eat thee up;” and saying these words the wicked Wolf fell upon poor Little Red Riding-Hood, and ate her up at a few mouthfuls. Also, uniform with this Volume, THE ROBIN REDBREAST PICTURE BOOK. With Forty-eight Pages of Illustrations, Printed in Colours by Kronheim & Co. Contents. Robin Redbreast. The Farm-yard A B C. My Mother. Nursery Rhymes. The Dogs' Dinner Party. Jack the Giant Killer.